(Plainfield, IN 4/15/14) The high level delegation of United States religious leaders that visited the Central African Republic (CAR) last Tuesday was a partnership among ISNA, the State Department, Office of the Special Envoy to the Organization of Islamic Cooperation (OIC), the Network of Religious and Traditional Peacemaker, and the Inter-religious Platform. The delegation included Imam Mohamed Haj Magid Ali, President of ISNA, Cardinal Theodore McCarrick, representing the U.S. Conference of Catholic Bishops, Rev. Leith Anderson, President of the National Association of Evangelicals, Mr. Rashad Hussain, President’s Obama’s Special Envoy to the OIC, and Mr. David Brown, Department of State Senior Advisor to CAR. 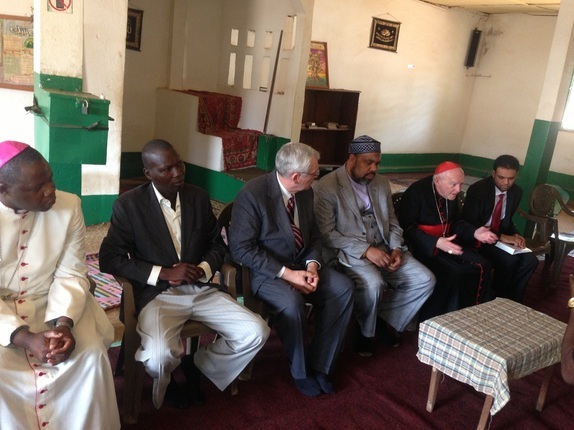 The visit began at a mosque where the delegation addressed a small audience of imams and community leaders. The next stop for the delegation was the cathedral where Cardinal McCarrick offered remarks to an audience of Christian leaders. Following the mosque and cathedral visit, the delegation met with the transitional President Ms. Catherine Samba-Panza in her office. They thanked her for the opportunity to meet in order to show solidarity with the people of CAR and exchanged ideas on how to rebuild the country. Because her top priority is to provide security and protection for her people, she appealed to the leaders to use their moral authority in order to spread messages of peace. There was also a closed session meeting with members of various civil society groups, youth leaders, women leaders, representatives of Anti-Balaka, representatives of Seleka and some representatives of NGO’s. The purpose of the meeting was to provide an opportunity for this group to meet with the U.S. religious leaders and share their experiences of peaceful coexistence. In addition, the religious leaders and representatives of the various groups signed a declaration rejecting violence and calling for inter-community and inter-religious dialogue. Dr. Mohamed Elsanousi, the Director of Community Outreach at ISNA’s Office for Interfaith and Community Alliances (IOICA) and Ambassador Ufuk Gokcen, Permanent Representative of the OIC, stayed a few days after the formal visit in order to meet with local Muslim community leaders at the Central Mosque and discussed how Muslims in the U.S. and around the world can help them. During this time, Dr. Elsanousi also had the opportunity to talk about strong interreligious relationships here in the U.S. He also met with OIC Special Envoy to CAR and Former Minister to Senegal Cheikh Tidiane Gadio, and discussed ways for OIC to assist with reconciliation and peace-building efforts in CAR. Overall, this trip was a success and has opened the door for future interreligious activities and initiatives in CAR.